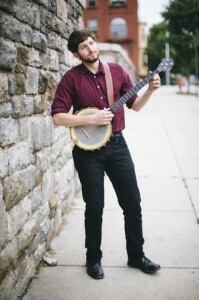 At the Delaware Valley Bluegrass festival on Sept. 4, 2016, Mandorichard sat down with Brad Kolodner, banjo player for the acoustic roots quartet, Charm City Junction. Brad is rooted in the traditions of Appalachian folk music, and embodies the next generation of old-time musicians both respecting the music that’s come before and modernizing the tradition with his artistic style and original compositions. In addition to touring and recording with Charm City Junction, Brad also performs with his father Ken Kolodner, a world-renowned hammered dulcimer player. According to their website, Charm City Junction “creates a fresh soundscape” that has “taken the acoustic music scene by storm.” Patrick McAvinue, fiddle; Brad Kolodner, clawhammer banjo; Sean McComiskey, button accordion; and Alex Lacquement,upright bass blend their different musical backgrounds together creating a common ground on which to develop their unique sound. Charm City Junction released their debut album in the fall of 2015, and are at work on their next CD. Mandorichard especially enjoyed talking with Brad about his gig as a weekly radio DJ for WAMU’s Bluegrass Country, a 24/7 Internet bluegrass and folk radio station in Washington D.C. “The Brad Kolodner Show” is a radio program that features contemporary bluegrass, americana and old-time music, as well as interviews with touring bands passing through the D.C. area. To learn more about Brad and Charm City Junction, check-out our interview! Brad Kolodner hosted by Mandorichard. Recorded Sept. 4, 2016. First aired Oct. 4, 2016.